This pork dish is one of the most popular Asian dishes, be it homecooked or dine-out order. 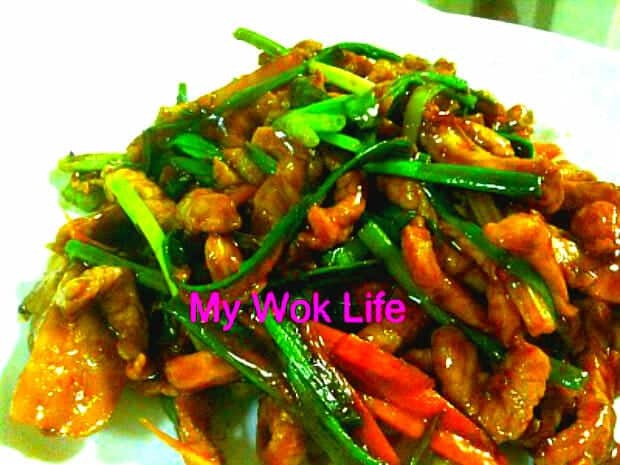 Remember the aromatic ginger and spring onion (also called it scallion) plus a touch of fragrant oyster sauce in its marination provide the classic stir-fry flavour in both the smooth bouncy pork and fragrant thick gravy. It simply complements just a plate of plain steamed white rice at its best.. This is truely mouth-watering! To have it at its fullest and for more complete diet, I have added carrot strips which indeed go so well with the rest of the ingredients in it. Rinse pork and cut into smaller deli-thin slices or strips. Season with the listed seasoning, for at least 20 minutes. Heat wok with oil over high fire. Add garlic and ginger, fry till fragrant. Add pork into work and stir fry for 1 minute. Add in also shredded carrot. Drizzle water and reduce heat to medium low fire. Cover wok with lid and simmer for 2 – 3 minutes. Remove lid and increase heat again to stir fry for few seconds. Add in light soy sauce and dark sauce. Stir fry to combine well. Sprinkle sugar and continue stir fry for few more seconds. Reduce heat to medium low fire, add spring onion. Stir fry for few strokes, and then, let all ingredients simmer for 1 – 2 minutes, or till water slightly evaporated. You may stir fry occasionally to avoid sticking. Pour corn starch slurry to thicken gravy in one circular motion, and stir fry for few seconds, before heat off. Dish up and serve. Tips: Add more water, if preferred more gravy. Hi, I just wanted to say I tried this and it is delicious! I just added a bit of worcester sauce but it’s not really necessary. Thanks for the recipe! Happy to hear that you cooked delicious dishes. Yes, it is not necessary to add worcester sauce to this recipe at all as it would yield more a sourish taste that may not be pleasant to this particular dish. This recipe is one of the best I’ve tried. I made this a week ago and it was absolutely gorgeous! My very fussy boyfriend, who is an utterly picky eater gave it a two thumbs up rating. Excellent blog, PatriCa. Keep it up! Thank you for your praises. Glad to hear that you enjoyed the dish from my recipe. Just made this today. Wife and 8 year old daughter say can put into regular menu. Pass with distinction! Thanks for recipe.